The eye has been said to be "the window to the soul". When drawing a portrait of someone, it is clearly important to know how to draw eyes. Sometimes we can look at just a person's eyes and know exactly who they are. The process is fairly straight-forward. After drawing out the basic contours, we'll gradually develop the tonal range of the eye. To create the representational effect that we're after, we'll gradually build up layered applications of graphite to develop the value and the texture. If realism is your goal, then patience must be practiced. Just like other art-making mediums like colored pencils or pen and ink, graphite applications must be patiently layered and deliberately applied. Textures develop through layered applications of graphite of varying hardness. Harder pencils, which produce lighter marks, are applied first. Softer pencils are applied on top, pushing values darker. If the softer pencils produce unwanted textures, then additional applications of harder graphite can be applied, working the material into the tooth or texture of the paper. For this lesson, a series of graphite applications are patiently applied on smooth Bristol paper. This surface creates smoother transitions of value, but easily smears. Draw the contours (outlines) of the eye. Shade the iris and pupil. Shade the whites of the eye, tear duct, and eyelid. Develop the skin texture around the eye. We'll begin the drawing by lightly and loosely drawing the contour lines of the upper portion and lower portion of the shape of the eye, leaving open the location of the tear duct. We'll start with the "H" pencil with very little pressure. Within this shape, we'll draw the shape of the iris, pupil, and a shape for the strong highlight that overlaps the pupil slightly. It's perfectly acceptable to draw with many light lines at this stage. We'll progressively place heavier pressure on the pencil as the drawing develops, which will lead to darker marks and values. Be patient and focus on capturing the shape of the eye. Next, we'll begin the slow process of layering values, starting with the darkest values within the pupil. Care is taken to preserve the highlight as darker tones are developed. This highlight will create the illusion that the eye is wet, so it's very important to preserve this area. It's much harder to go back and erase out a highlight when working with graphite. The pupil will eventually be the area of darkest tone within the drawing. We'll slowly build up the dark values here. By slowly layering darker applications, we have greater control over the values produced and we can potentially avoid "graphite shine". Graphite shine happens when heavy applications of graphite are applied and flatten the tooth or texture of the paper, resulting in a very shiny area of graphite. Within the iris, marks are made radiating from the center. While most of the darker marks are linear, a few form organic shapes. By gradually adjusting the values in this area, we can begin to create a more realistic appearance. The iris is actually made up of two closely layered sections - the stroma and pigmented epithelial cells underneath. By gradually adjusting values, we can develop a subtle, three-dimensional appearance. The outer and inner portions of the iris are developed with slightly darker values. While the "H" pencil lays the groundwork, we'll need to start pushing the values darker. A slightly darker and softer "HB" pencil is applied to progressively darken the values in the pupil and the surrounding iris. In any eye that you draw, there will be inconsistencies and unusual shapes. You may notice small spots of darker tones or wavy lines. We'll need to include these details in order to create a drawing that is realistic. We'll begin to develop these "imperfections" with the HB pencil over the lighter H applications already in place. The texture of the iris is smooth and this should be reflected in our drawing. Although the surface of the paper on which we're working is already very smooth, the texture of the paper is still evident. This means we'll need to alter the graphite applications to create a more natural illusion of texture. A blending stump is gently used to soften the texture. The blending stump is pulled in the same direction as the strokes made with the pencil to preserve the pattern of lines and shapes within the iris. After the blending stump has been applied, you may find that the contrast between the values has been muted slightly. If this is the case, you can revisit the iris with the HB pencil and restore some of the contrast lost. Doing so will just create additional depth to the drawing. Now that we have a base application of lighter graphite in place, we can switch to a darker graphite pencil. In this case, a General's Layout pencil is used. This pencil is equivalent to a 4B pencil in darkness - however, it is relatively hard, meaning that it keeps a sharper point for a longer period of time. We'll then continue to slowly build up darker values with the darker pencil, making sure that we continue to preserve the strong highlight that overlaps the iris and the pupil. As we continue to develop the darker tones, the contrast and range of value increases in the drawing. Step 3 - Shade the Whites of the Eye, Tear Duct, and Eyelid. After darkening the values of the pupil and iris a bit further with the darkest graphite pencil, our attention now turns to the other areas within the eye. A gentle application of the "H" pencil is applied to the "white" of the eye on the right side. Remember, the eyeball is a sphere. This means that the values will be slightly darker on each edge of the eyeball. In this example, we see that the shadow is rather strong on the right side, since the light source is originating from the left. The tear duct is also darkened, leaving hints of lighter value within. This area is also wet, and the preservation of strong highlights here will help to create this illusion. The top eyelid overlaps the eyeball. In most cases, the light source originates from above, producing a shadow just underneath the eyelid. A cast shadow can also be found on the eyeball, just underneath the eyelid. The underside of the eyelid is darkened and the crease above it is enhanced. The same process of layering graphite applications is followed - "H", "HB", and "General's Layout Pencil". As graphite is added, we can blend applications with the blending stump, softening the texture. A few visible wrinkles are added on the left side of the upper eyelid crease, before adding a light application of graphite on the skin below the eye. The textural development of the skin underneath begins by making small shapes, isolating subtle areas of lighter value. As we have thus far, we'll slowly build up applications to progressively make the values darker and build up the illusion of texture. A light application of graphite is applied here with the H pencil. The contrast within the areas of skin texture is enhanced by progressively making the shapes a bit darker with applications made with the softer graphite pencils. With a slightly greater range of value, the texture of the skin becomes more realistic. As this happens, areas around the eye are also darkened, resulting in more contrast between the eye and the skin around it. This process is repeated to develop the illusion of skin texture above the eye. With most of the layered graphite applications in place, we can add the eyelashes. With a sharpened "HB" pencil, bold lines are pulled out from the skin. These lines mostly curve down and then up for the top eyelashes, with a few lashes bending in unpredictable ways. For the bottom lashes, the opposite is true. The lines are pulled upward and then down. They are less concentrated than those found along the top lid. Using the "H" pencil, a few indications of veins within the eye are added to complete the drawing. Now that we've had a look at the basics of drawing a realistic eye with graphite alone, let's take a look at another example. In this second example, we'll again draw an eye from a frontal view. The following examples come from the course, "Portrait Drawing the Smart Way". Check out the course for instructional videos and ebooks that break down the drawings in more depth. Before, we applied graphite pencils to a white surface. Because we were adding dark material to a white surface, we were constantly working to darken the values. Highlights were created by leaving the white of the paper "open", or by applying light pressure on the pencil before blending. When graphite is applied to a white surface, we start at the top of the value scale (white). We then have to work the values towards the bottom of the scale in order to create a full range. This approach is perfectly acceptable, however you may find that working on a toned drawing surface gives you an advantage. When we work on a toned surface, we can push the value range in the drawing by starting close to a middle value. This means that we can use a white drawing medium to add the highlights, instead of relying on the "white" of the paper. This approach allows us to push the values from the middle of the value scale instead of working from one extreme, like white. This is why many painters choose to apply a "ground" (a base color other than white) to an empty canvas. It provides a value or tone from which to begin work. With painting, colors and values can be compared to the color and value of the ground as they are added, allowing the artist to make better decisions about the values as they paint them. On a gray drawing surface, we start with a gray "ground", much like a painter may choose to do. We'll start this drawing in the same way that we begun the last. We'll first evaluate the contour lines or outlines of the eye. We'll look closely and study the angles and curvature of each of the lines that should be included. We'll also look for spacial relationships between the "whites" of the eyes, the pupil, and the eyelids. By making comparisons, we can be more accurate with our initial marks. With an understanding of the contour lines, we can begin to make marks with a light H graphite pencil. We'll draw the contour lines of the pupil, iris, and eyelids. We'll also mark out a shape for the strong highlight. It is this highlight that will make the eye appear wet. To make the values slightly darker, we'll switch over to an HB pencil. The pupil is usually the darkest area within the eye, but you may find that some shadows are also rather dark. We'll gradually push the values darker. By progressively layering darker and softer graphite pencils, we have complete control over the values. We can always make values darker if needed - but if we go too dark, too quickly, then it's difficult to reverse. As we develop the darker tones found within the iris, we'll pull strokes towards the pupil. The pressure placed on the pencil is varied in order to create variety in the tone. This results in a pattern that closely resembles the pattern of color that we find on the inside of the iris. To smooth the application, a blending stump is used. Directional stroking is important with the blending stump. Strokes should be pulled in the same direction as the pencil applications. After addressing the tear duct, we'll gradually work our way to the eyelid and surrounding skin with the HB pencil, blending applications as we go. In this case, the skin around the eye features a variety of different tones and small imperfections. We'll vary the value in areas in order to create this illusion. At this point, it's time to start pushing the values even darker. We'll switch over to a 2B pencil, which is darker and softer than the HB. The pupil is darkened, again leaving space for the strong highlight. The darkest shadows under the upper eyelid and the crease created by the eyelid are darkened. Since we're working on toned paper, we have the benefit of adding highlights with a white drawing medium. In this case, a white charcoal pencil is used since it can be blended with a blending stump. The strongest highlight on the eye is addressed first, applying heavy pressure on the pencil. Then with lighter pressure, we can begin addressing the areas that are lighter in value, including the "white" of the eye. Just as we did with the graphite applications, we'll blend the white charcoal applications with a blending stump. Not only does this eradicate some of the texture produced by the paper, but it helps to create transitions of tone between the darker areas and lighter locations. The strong highlight in the eye is not blended since we want this area to remain strong. Now we'll bring some of the white charcoal to the skin around the eye and gently blend the material with a blending stump. We'll also add some of the strong highlights that occur on the bottom eyelid. Just as the highlight added within eye made it appear wet, these highlights serve the same purpose. To ensure the highest level of contrast, we'll avoid blending these locations with a blending stump. Then, with our initial highlights in place, we'll switch to an even darker, 4B pencil. We'll begin pushing the contrast, starting with the darkest locations in the pupil. Once we've established some of the darkest tones, we're ready to draw the eyelashes. This part of the process can seem intimidating since we'll make marks over portions of the eye and the surrounding skin. However, there is a method that we can use to ensure that our eyelashes appear realistic. This method involves thinking of the eye as quadrants. By dividing the eye into four quadrants, we can make decisions concerning the direction of the strokes for each eyelash and the direction of these strokes. In quadrant 1, we should expect to see the longest and darkest lashes. Stokes made in this quadrant will dip down before extending back up and to the right. The eyelashes are the most dense and frequent in this quadrant. As we near the middle dividing line, the strokes begin to become more vertical. Quadrant 2 has the second most number of eyelashes. In this quadrant, the strokes dip downward before extending back up and the left. In quadrant 3, we see less eyelashes. They are more sparse and much shorter. We can often notice a spacing created by the lower eyelid of bare skin. The eyelashes in this quadrant bow upward slightly before extending downward and slightly to the right. Quadrant 4 has the least amount of lashes and in some cases, you may notice that this area is completely void of any eyelashes at all. Eyelashes that you find in this quadrant bow upward slightly before descending and slightly extending to the left. By breaking down the eye into four quadrants, we can approach the process of drawing the eyelashes with more confidence. Find a place to begin that's comfortable for you. In this case, we'll start near the center, in quadrant 2, pulling strong strokes downward and slightly to the left. We'll gradually work our way across the upper eyelid, using a sharpened 4B pencil. Vary the direction of your stroke, allowing it deviate slightly from the formula we discussed. After working our way across the top of the eye, we'll address the eyelashes found on the lower lid. Again, we'll start on the left side, in quadrant 4. We'll work our way across, leaving a visible portion of skin between the eye and eyelash. The eyebrows are simply smaller hairs that extend out from the skin above the eye. Just like eyes, eyebrows come in many different shapes and sizes. It may be helpful to lightly draw the shape of the eyebrow before drawing any of the actual hairs. After defining the shape, we can make deliberate strokes with a sharpened 4B pencil, pulling out each stroke. Closer to the bridge of the nose, these strokes may be nearly vertical. As the eyebrows extend outward, the hairs usually become longer and more horizontal. Again, we'll vary the stroke. Some marks should be darker and thicker, while others could be slightly thinner and wispy. Softening the strokes with a blending stump makes the eyebrows appear more realistic. Just as we did before, strokes made with the blending stump should flow in the same direction as the pencil marks. Now we'll complete our second drawing by adding a few additional highlights with the white charcoal pencil. We may choose to strengthen the highlights in areas to increase the contrast and broaden the range of tone. We can also look for opportunities to make the values darker in areas. We can revisit areas such as the pupil and shadow under the eyelid with the 4B pencil. We'll continue to push the relationships of the highlights and shadows until we're satisfied with the range of value, contrast, and texture. We don't always see the eye from a frontal view. In fact, in many portraits, the eye is positioned in a different place depending on the angle. For this reason, we'll take a slightly different approach. The steps involved are similar, but slightly different. To better understand the positioning of the contour lines, it may be helpful to sub-sect the subject into a mini-grid. You can do this by simply drawing two intersecting lines over your reference photo. Draw a vertical line so that it overlaps the pupil. Then draw a horizontal line from one corner of the eye to other. Depending on the angle of the eye, you may be left with a skewed grid. This is fine since you can still use these lines to make comparisons, which is the purpose of the grid. Using the intersecting lines as a guide, we can draw a few more straight lines to designate the outer edges of the eye. Diagonal lines are drawn from the top and bottom of the eye to each corner. Drawing the mini-grid is completely optional, but it may be helpful if you find it difficult to locate the contours. Now we can begin drawing the contour lines. Be sure to draw shapes for the pupil, iris, tear duct and the strong highlight. Since the eye is viewed from an angle, the shapes of the pupil and iris will not be circles. Instead, these shapes are ellipses, which is a distortion of a circle. After drawing the contour lines with a light, H pencil, we can begin adding some of the darker values. Initial applications can be made with an H or HB pencil. Start in the locations that are the darkest, making sure to preserve the areas of strongest highlight. For the patterns of the iris, we'll again pull strokes from the pupil. In many cases, the tone becomes quite dark around the outer edges. You may use a darker pencil here or simply apply more pressure. We'll also be sure to add a cast shadow underneath the eyelid. To eliminate some of the texture of the paper, we'll use the blending stump to smooth our applications as we go. With our initial darker tones in place, we can begin adding the highlights with a white charcoal pencil. We'll start with the strong highlight that overlaps the iris and the pupil, applying heavy pressure. As we did before, we'll apply less pressure as we address the lighter values of the "whites" of the eye, the tear duct, and the surrounding skin. Again, the blending stump is used to soften the texture. To make the eye appear wet, additional strong applications of the white charcoal are applied to portions of the "white" areas along with a couple of marks applied within the tear duct. After adding the lighter values, we can go back with a softer 4B pencil and make some of the shadows darker. This makes the highlights appear stronger since the range of value is increased. Now we'll add the eyelashes. We'll need to think about the angle of the eye in order to create convincing eyelashes. Logically, the strokes created for the eyelashes should dip down and extend back up slightly. But from this angle, you'll notice that some of the top eyelashes may not even make it back up to the eyelid. We can see this in the image below. Notice how the top eyelashes on the right side of the eye simply extend down and slightly to the right. You'll also notice that we can see a bit of the skin of the upper eyelid on the left side of the eye. In other words, the eyelashes extend out from the eyelid, not the eye itself. In this example, we can clearly see that this also happens for the bottom lashes. Again, allow some variety in the strokes. Some should be longer, while others are shorter. The strokes should also change direction slightly. In order to increase the contrast, you may find that you need to revisit areas with darker and lighter applications to finish the drawing. Now that we've had a comprehensive look at drawing the eye, let's briefly discuss the location of the eyes relative to the head. It is often assumed that the eyes are positioned at the top of the head. Instead, the eyes are found in the middle of the head. If we draw a line from the top of the head (excluding the hair) to the bottom of the chin, we can expect to find the eyes in the middle. This assumes that you're looking directly at your subject. If the head is tilted, or viewed from a different angle, then the positioning will also be different. Just like with any of the other facial features, your eyes need to be proportional to the head. An easy way to ensure that your proportions are correct is to draw 5 light ovals that match the width of your eyes across the face from the end of one ear to the other. Most heads are approximately "5 eyes" wide. If you find that you can fit more ovals in this space, then your eyes may have been drawn too small. If you cannot fit 5 ovals across this width, then your eyes may have been drawn too large. 1. Look at the eyes that you are trying to draw - I know - this tip seems pretty obvious. But many people try to draw what they think they see, rather than what they actually see. Look at the shapes, lines and values and do your best to copy that info on your paper. Don't think about drawing eyes, think about drawing shapes, lines, and values. 2. Remember that every eye is different - No two eyes will ever look the same. 4. Eyes have a full range of value - Most anything that you draw or paint should incorporate a full range of value. Eyes are no different. If you need to use a value scale to ensure that you have used a full range of value - then do it. The darkest darks and the lightest lights should all be there. 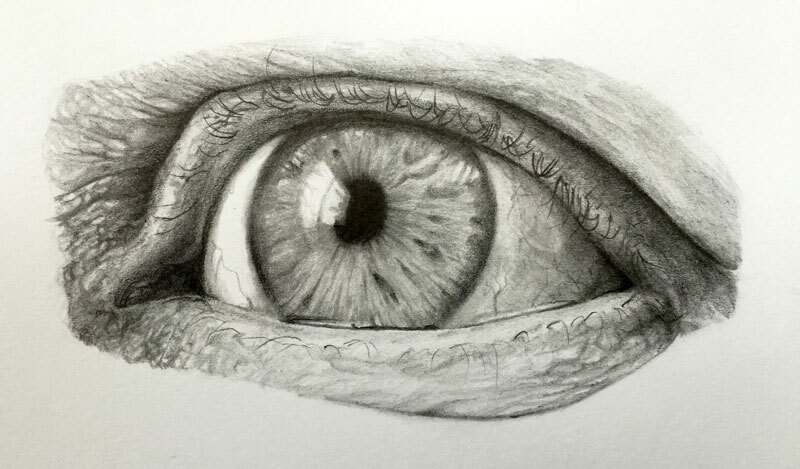 This lesson explored drawing a realistic eye with graphite pencils. And while many of the concepts that we covered here carry over to other drawing mediums, it may be helpful to see how this process is slightly different when a different drawing or painting medium is used.